I don’t know about you, but this “back-to-school” talk just doesn’t seem right. I see the kids shuffling about with their overloaded backpacks and wish there were a couple more weeks of summer to enjoy. We’re heading back to the preschool in September, so I figured we would take advantage of the time we have left and do some super fun – and messy – art projects. Kenneth Noland is the last artist that might come to mind when thinking about making a mess. His paintings of circles and other geometric shapes are precise, edged, and clean. A few of his creations venture a bit into the crazy painter arena with some smudged lines and coloring outside the lines. But, for the most part, Noland’s artworks are all about detailed and crisp creations showcasing shapes and lines – mostly circles. And, you know how much we love circles at my house! The perfect messy art project came to mind while I was gathering up a few random lengths of string. One of Noland’s paintings, Heat, 1958, popped into my head while I pulled out some vibrant tempera paint – and held onto that string. This is an excellent outdoor art activity perfect for kids of all ages – even the little ones like mine. And you don’t need much to make things happen. A few lengths of string, a couple of paper plates, and colorful tempera paint offer hours of Kenneth Noland inspired fun. Take a closer look at Noland’s artwork (there’s some funky jazz playing during the slide show – bonus!) with your child and encourage her to point out the colors and shapes she finds, honing her recognition and creative skills. Now grab some white paper, along with the other materials (paint, string, paper plates) and head outside. You might want to bring some paper towels for clean-up if you don’t have access to a garden hose! Find a nice level spot to get working. A picnic table or even the driveway works perfectly. 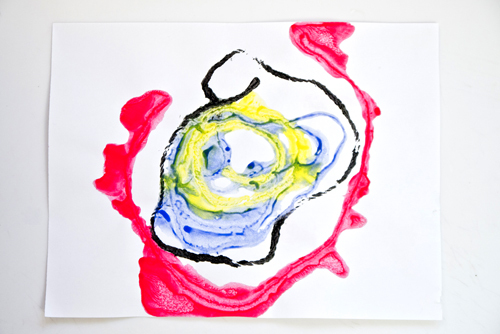 Help your child put a bit of each color of tempera paint she selected on the paper plates. She can use any colors she likes and then add a few drops of water to thin the paint out for the project. Help your child place a sheet of paper on your flat work surface and get ready to make a mess! 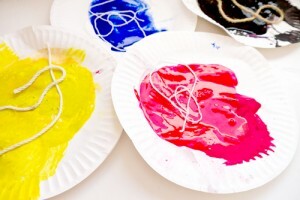 Invite your child to place a piece of string, about 1-foot in length, in each of the plates of color. She can squish the string in the paint, really soak up lots of paint. Now she can lift the paint-filled string from the plate and squiggle and squirm it into a circle on the white paper. She can do this by standing or kneeling over the paper and using her arm to make a big (or small) circle movement while positioning the string. She can continue sliding strings out of the plates and positioning them until she has a paper full of painted strings. Now she can place a fresh sheet of white paper over the top of her strings, gently give things a bit of a press, and then remove the paper. Now she can lift up the strings, place them back in the correctly colored plate, and check out what’s left behind. Both papers reveal fun and vibrant radiating circles! While her messy circle Kenneth Noland creation is drying, she can experiment with making more string art in any style she’d like! The finished artworks can be displayed in her room for a pop of crazy color. Cute and fun! I may just have to try this soon with the neice!